The Chair of this session, Rev. 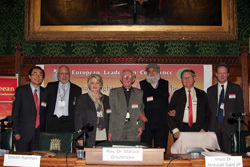 Dr. Marcus Braybrook stated that, in faith communities, we have the task of raising collaborated awareness on the cases of infringements of the religious rights of minority groups, and the responsibility of translating the words of human rights documents to make them compatible with religious teachings, falls on the religious communities themselves. Mr. Willy Fautre, the first speaker of the session used the persecution of Unification Church members, especially in Japan, as a case study to highlight the hugely complex extremes that people will go to in order to violate a person’s human right to adopt a religion and the laws relative powerlessness to combat the issue as it is happening to a minority and there is very little intervention of the social level. Katharina Grieb spoke in German with translation. In her talk, she spoke about Christian persecution, not just during the post-Pentecostal periods, but in modern times, usually being manifested in political suppression or peer induced, anti-Christian activities. During her speech, she brought attention to many cases of where religious freedom, Christian freedom in most examples, has been compromised. Some examples given were; the North Korean policy of imprisoning whole families as a punishment for practicing the Christian faith, under Fidel Castro in Cuba, suppressing religious activity by shutting down religious institutions and the Muslim community in some parts of Africa is demonising Christians. The opening points Imam Dr. Abdulijalil Sajid JP, the third speaker made, were to clarify and distinguishbetween the religion of Islam itself and the individuals who go against the teachings of Islam in persecuting other religious groups, often using misinterpretations of Islam to justify their means and ends. He stressed a role of religion, a source of identity and community amongst many people, is as a social institution, performing many valuable roles in the areas of charity and support for all people whether they are empowered or disempowered. After expressing his view about the rightful separation of religion and state, he expressed the necessity of secular-liberal democracies to promote the social inclusion of religious minorities, not to side-line and undervalue the need and role religion can play. There is no need to have personal animosity amongst groups. 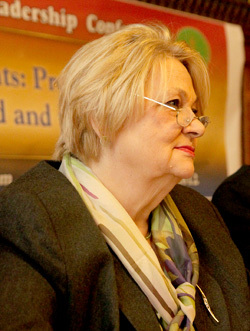 Debate can exist between majorities and minorities, but it is no reason for political and ideological fractionalisation. After quoting article 9a European Convention on Rights, Human Rights Act 5a – “Protect religious minorities”, he heatedly calls on the room to judge a state by the way they treat their minority citizens. To remember that having rights also entails responsibilities which extend to those within our own communities. Sheikh Rahman gave an emotional speech about mistreatment of minority goups, citing some recent legislation that had been passed in Pakistan in order to clamp down on the Ahmadiyya Muslim community. The enforcement of this law went as far as to include the tearing down of an Ahmadiyya mosque. There has been insufficient coverage given by the media and, as a direct result a lack of collective action amongst religious and political groups against the problem. Sheikh Rahman gave a plea for such bigotry to be tackled in its early stages so as to ensure that it does not develop into a more serious series of acts against minorities in the country like those committed in Pakistan.